A University of Southampton law student has scooped top honours in the TARGETjobs Undergraduate of the Year Awards. Twenty-one year old Alex Hughes beat off stiff competition from thousands of other students from over a hundred UK universities to win the title of ‘Law Undergraduate of the Year 2014’, sponsored by global legal services firm Mayer Brown. His prize is a work placement with Mayer Brown in the summer and an iPad. Alex says: “I am absolutely delighted to have been named the UK Law Undergraduate of the Year. It's great to receive recognition for all the hard work I've put in over the years. Through a series of online tests, application forms, interviews and assessment exercises, Alex proved he has the winning combination of academic excellence, good written communication and first-class interpersonal skills needed to put him among this year’s recipients of the awards. He was one of ten students shortlisted for the Law award who were asked to deliver a presentation on the most important issues and challenges facing city law firms. Mayer Brown recognised that Alex’s presentation was very well researched and delivered, helping him to secure his place as the winner for 2014. 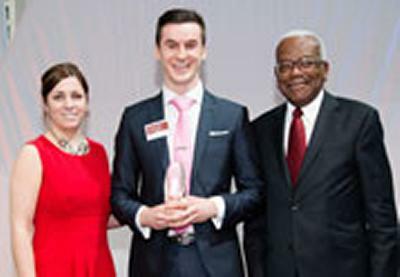 Alex received his award from former ITV News presenter Sir Trevor McDonald and Caroline Sarson, Graduate Recruitment and Development Manager from the sponsor Mayer Brown, at an awards ceremony at Canary Wharf in London.